We offer a professional giftwrap service to complement your pen or leather journal. Simply check the giftwrap option on the product page before you add to basket (a charge of £2.75 will be added). We use a premium silver giftwrap paper with a subtle two-tone patterned effect, and a hand tied silver ribbon. We also include a matching gift tag, which can be appended with a message of your choice. Simply add your message to the text box when you reach your basket. Items are giftwrapped individually i.e. if you order several items only the specific item requested will be wrapped. We do not include any paperwork inside the giftwrapped item. If you select a different delivery name to your billing details, we add a gift receipt which hides all prices. 4 hours 57 minutes for despatch today. When will you receive your product? Next Working Day & Saturday Delivery orders are sent via Royal Mail's Special Delivery service and will require a signature. All orders placed after 3pm will be despatched the following working day. The beloved TWSBI ECO in a new ergonomic design. Transforming the distinctive hexagonal cap and piston twist tip into a more triangular silhouette, the ECO T’s shape is a reflection of its functional grip section. The demonstrator style transparent body allows you to see the piston fill workings and remaining ink levels, whilst a rubber O-ring between the barrel and twist-off cap ensures a secure, sealed closure, preventing leakage and drying. The TWSBI ECO T fountain pen offers a superior quality piston-fill fountain pen at a wallet friendly price. All TWSBI fountain pens can be disassembled for cleaning and maintenance. 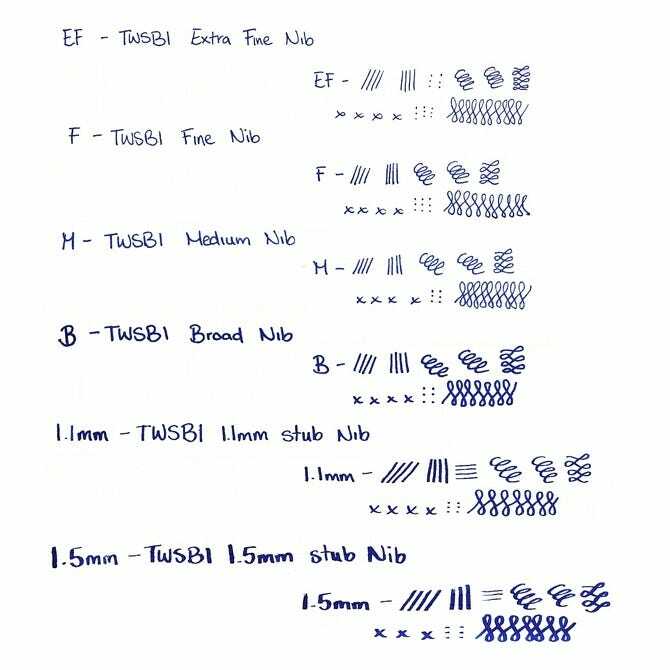 TWSBI includes the tools to do so, but recommend this is only carried out by experienced fountain pen users. This should only be carried out as part of long term servicing of the pen; it will not need to be done straight away. All disassembly is carried out at the owners risk! All orders placed before 3pm Mon-Fri are despatched the same day (except on a bank holiday), even if your order has personalisation. Orders placed after 3pm, at the weekend or on a bank holiday are despatched next working day. Please see our delivery page for Christmas delivery deadlines. UK: We use a Royal Mail tracked service. Standard delivery is free and takes 2 to 5 working days, Premium is £3 and takes 1 to 2 working days. Next working day is £6 and is delivered by 1pm (requires a signature). International: All international deliveries are passed to your national delivery service. Deliveries to Europe (£6) take 3 to 7 working days, and Rest of the World (£10) takes 7 to 10 working days. After 40 years manufacturing for other well know brands, TWSBI started their own range of pens. Their fountain pens use innovative piston filling mechanisms (such as springs and vacuums) that make it quicker and easier to fill the pen with ink. Designed with transparent bodies so you can see the inner workings of the pen, TWSBI supply a toolkit with every writing instrument so you can take it apart and clean thoroughly. If you are unhappy with your items, they can be returned to us within 21 days of receipt of purchase to be eligible for an exchange/refund (Items purchased for Christmas can be returned by 14th January). The item must still be in a re-saleable condition and returned with proof of purchase. Items that have been personalised cannot be returned unless they are faulty. Should you receive a damaged or incorrectly dispatched item, please inform us within 7 days of receipt, so we can advise you on the return of the item. Call 0208 731 8610 or email [email protected]. If a faulty or incorrect item is returned, we will refund your postage up to the cost of 1st class recorded Royal Mail. If you are sending items from abroad, please call us for a delivery quote.